I really want to add the 2007 Cher dolls to my collection. The photos of Cher in that Indian outfit and that black skimpy number are to die for in the photos I've seen. 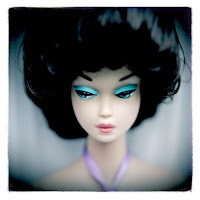 The problem with photos in the magazines or on the web are that they are frequently of protypes of a doll and do not reflect how a doll actually looks when it hist the shelves. The facial mold may be a tad diffferent and my major pet peeve are cheap-looking materials. 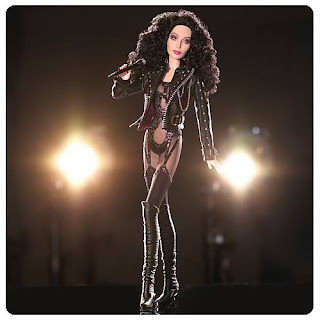 In an affort to keep my collection focused, I really need to skip the purchase the Cher dolls. Since they are less than $40, it's likely I'd be disappointed anyway. 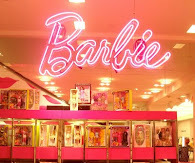 Also, I'm glad I found this Barbie blog of yours. I've been working on some print ads for Barbie Fashion Fever and this would have really inspired me if I had found it earlier. It's a totally cool blog and I love your collection! 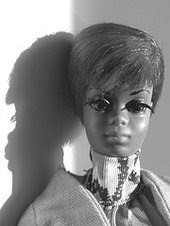 Wow, that doll is a real good representation of how anorexic and disgusting she looked when wearing that out fit in real life.